Hi all! Today went really well for such a fantastically stressful part of the season! We didn’t have any calls about chicks down, so that’s great!! I went to check on the jail birds this morning before work. I only saw two on the ledge and so I spent a good little while checking out the alleyways and such around the area, just in case one of the chicks had fledged and gone down. I didn’t find anything, so I went up onto the garage top to get a “bird’s eye” view. 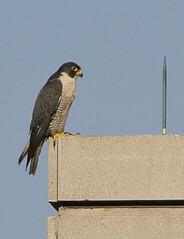 All of the surrounding rooftops seemed clear of any juvenile peregrines. However, one of the MCC adults was in the area, napping on the roof of the Board of Trade annex. I took my camera out and snapped a few pictures, hoping it might be Max and he might at last give me a look at his leg band number. Whether it was or was not, I’ll never know – the bird sat down on its feet the whole time I was there. So, finally, I absolutely HAD to get to work. Late, of course. Le sigh. Good thing I have a great boss! Carl and I have three interns working with us again this summer. One, Michael, is now in college and has returned this year for another go. The other two hail from Oak Park – River Forest and are in their last years of high school. At some point during the day, one of the high schoolers, Lakshmi, overheard someone come in to ask permission to use one of my peregrine photos for a journal article. She asked me what this peregrine stuff was all about and I told her the story. As is the usual reaction, she was shocked to find out that we had such illustrious birds in our urban midst. So, at the end of the work day, I asked her if she’d like to go with me to the LaSalle station to see the birds. She excitedly agreed. It’s always so cool to see how excited people get when they first see peregrines. Lakshmi was no different, to my delight. After awhile, she bid me adieu and I started watching the prison birds in earnest. 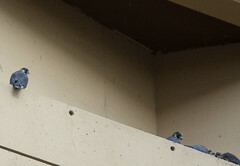 Again, only two birds perched on the jail ledge. I could see lots and lots of activity off to the east. 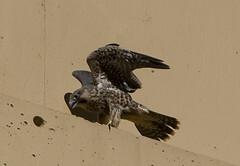 Two peregrines swooped and dove in the airspace near the CNA building. Herc and Max love to use the area around CNA to flight train their fledglings, so part of me wondered if one of the birds might not be the missing juvenile. However, both seemed to be very accomplished aerialists, so I had my doubts. I got my binocs out to see what I could see at that great distance and got a few flashes of bright white, which more or less confirmed that the two birds I was watching were adults – probably Herc and Max. The hours passed. I tried to keep really low profile so that the CTA wouldn’t have reason to kick me off the platform. I hoped to see one or both adults come in at least once for a feeding – if the third chick was down in the nest, it would likely pop up at that time, so I could get a chick count. And, of course, I’d have one more shot at Max’s bands. At about 7:15pm, the adults came in towards the nest with an immense pigeon in talon. They landed up and out of sight on the Board of Trade annex and not long after, a shower of feathers began to rain down as they plucked the prey. The chicks began to go berzerk at the sight of their parents and food – most likely more the latter than the former. Several times, I thought they’d end up pushing each other off the ledge as they jostled and screamed. Just as Max flew overhead towards the ledge, I felt a tap on my shoulder – CTA security. Sigh. As I explained to the guys what I was doing, I managed to surreptitiously snap a few more photos. By that time, it was actually pretty dark and I had to push the ISO up to 1600 to get anything handheld. I figured the pictures would be pretty grainy, but maybe I’d get something. The nice young security men escorted me off the platform and back down onto the street just as Max took off with the remains of the prey in his talons. It was a good time to go anyway. So! Three babies on the ledge still, which is good. And one good look at Max! ~ by Steph on June 18, 2008.